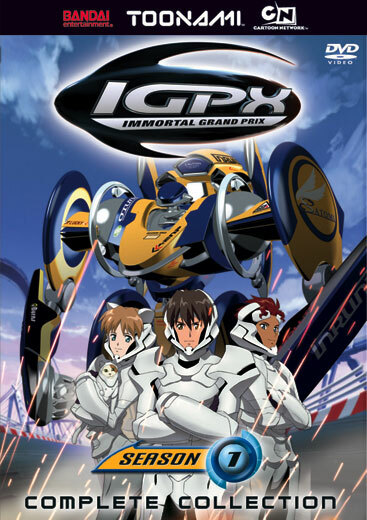 One of the most fresh and interesting spins on the mecha anime genre from the 2000s is IGPX, a series that pits teams of three racers in giant bots travelling at mach speeds down a twisting, careening course. The mechs travel with graceful motions, alternating between a flat vehicular mode and an upright stance where their metal bodies seemingly skate down the track. While the primary focus of the race is to see one team cross the finish line before their competition, there are also fight segments that add an extra level of entertainment and danger to the competition, thus requiring teams be as fast as they are furious. Most important, though, is that teams be organized and strategic – an element that proves the largest focal points for this first season, as Team Satomi’s young up-and-comers are as ambitious as they can be reckless. The three lead characters are Takeshi, Liz, and Amy, and they could not have more different personalities – a factor that often leads to them beating heads and occasional falters in their strategies on the raceway. Takeshi is the team’s lead who is in it to win it and wants nothing more than to prove himself against the likes of longtime hotshots such as rival Team Velshtein’s poster boy pilot Cunningham. While he generally carries a positive attitude, Takeshi can be blissfully unaware of the greater challenges he and his teammates need to overcome at times, which – coupled with Liz’s brash demeanor and short temper and Amy’s soft-spoken personality – leads to their first season being filled with many important learning experiences. 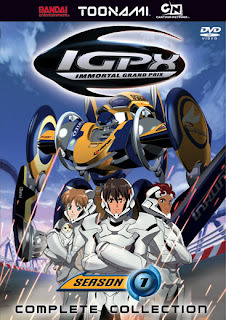 IGPX is a rare breed for its genre, as there is as much (if not more) time spent exploring the characters, the tech, and the culture of the series off the track as there is in the midst of the pulse-pounding raceway action. Each character gets ample time to develop, and the tendency the genre has to pull as ‘character of the week’ routine by featuring one character prominently for an episode and then sweeping them off to the side for the better part of the remainder of the season is avoided. Team Satomi’s crew proves as prominent as the racers, receiving nearly as much screen time. Even the rival team members are explored to a decent extent, offering viewers with case studies on what makes them tick to better set the stage and amp up the tense atmosphere of the races. Team Velshtein is well-known as the favored veterans, Team Skylark consists of three lethal beauties, and Team Sledge Mamma is notorious for their rough and tough tactics. The artistic direction in IGPX is akin to that of Blue Submarine No. 6, albeit much more colorful. While everything is digitally animated, the character models are drawn in 2D while the mechs and the raceway and rendered in 3D models. However, due to a higher level of detail in the character designs and environments, better lighting/shading effects, and a light layer of cel-shaping over all the 3D assets, IGPX manages to pull off this look significantly better than Blue Submarine No. 6 – as it should, considering the two shows aired more than half a decade apart. Interesting camera angles increase the fun factor for this ‘F-Zero with robots’ creation, further aiding in the show’s noteworthy degree of visual immersion. The soundtrack is comprised of a surprising variety of tunes, many of which are in keeping with the unique brand of techno that has long graced the promo segments and returns from commercial breaks on Cartoon Network’s Toonami block. Some songs are funky in a Jet Set Radio fashion, others mellow with emphasis on piano to help cultivate a scene focused on Takeshi’s personal struggles outside of the cockpit. Of course, the most interesting listens are the fast-paced, mildly repetitive tunes that accompany the action on the track, be it Liz’s mech bashing into a rival racer’s, or Takeshi’s mech experiencing technical troubles due to suspected sabotage. As mentioned above, IGPX’s first season is largely focused on Team Satomi learning to work together and overcome their individual weaknesses to better their strategies and relationships. This leads to a methodical somewhat predictable formula, as every time Takeshi gets himself into a pickle, it will take another episode for someone to talk some sense into him and for Takeshi to subsequently draw whatever lesson he needs to from that exchange. Nonetheless, the races are a blast to watch, and the series is a bold and successful journey into territory outside of the traditional (and stale) super-powered combat mecha formula. Anime update: Stand up to the Victory!